Basket-weaving is one of the oldest known Native American crafts--there are ancient Indian baskets from the Southwest that have been identified by archaeologists as nearly 8000 years old. As with most Native American art, there were originally multiple distinct basketry traditions in North America. Different tribes used different materials, weaving techniques, basket shapes, and characteristic patterns. 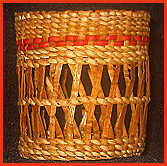 Northeast Indian baskets, for example, are traditionally made out of pounded ash splints or braided sweetgrass. 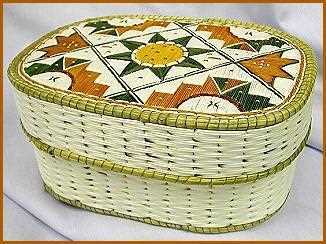 Cherokee and other Southeast Indian baskets are traditionally from bundled pine needles or rivercane wicker. Southwestern Indians make baskets from tightly coiled sumac or willow wood, and Northwest Coast Indians typically weave with cedar bark, swamp grass, and spruce root. Northern Indian tribes like the Ojibwe and Dene craft birchbark baskets, and the Inuit even make whale baleen baskets (though this is a more recent tradition than the American Indian ones). 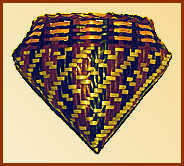 As native people were displaced from their traditional lands and lifestyles, their traditional tribal basketweaving styles started to change somewhat as they adapted to new materials and absorbed the customs of new neighbors, and in places like Oklahoma where many tribes were interred together, fusion styles of basketweaving arose. However, unlike some traditional native crafts, the original diversity of Native American basket styles is still very much evident today. If you are looking to buy baskets that were actually made by Native Americans--either because it's important to you to have the real thing or because you want to support native people with your purchase--then here is our list of American Indian artists whose basketry is available for sale online. If you have a website of native baskets to add to this list, let us know We gladly advertise any individual native artist or native-owned art store here free of charge, provided that all baskets were made by tribally recognized American Indian, Inuit, or First Nations artists. On our main site we do our best to avoid slowing down our page loading with graphics, but this page is about art, so we'd really be remiss in not showing a few representative basket pictures. All photos are the property of their respective artists; please visit their sites to see their work in more depth. by Navajo and Hopi Indian weavers. Another nice selection of Hopi wicker and coil basket plaques. 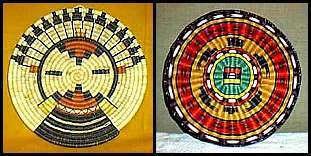 Basketry art for sale online from a cooperative of Papago Indian artists. Indian tribes of Northern California. including trinket baskets, willow burden baskets, and basket hats. Birchbark baskets from the Ojibway, Dene, and Atikamekw tribes. Award-winning ash splint baskets. Email the artist for prices/availability. Black ash and sweet grass baskets by modern Penobscot and Passamaquoddy artists. 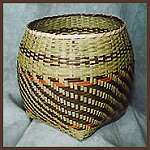 Ash splint baskets and fishing creels by another good Penobscot artist. Her niece is learning traditional basket-making now and has her own site, Wind Dancer Basketry, where you can find good baskets in similar styles. 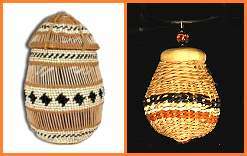 Traditional Southeast Indian rivercane baskets by an award-winning Chitimacha weaver. Email her for availability. 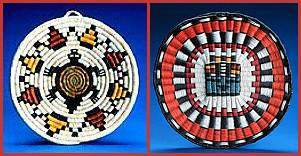 Single- and double-wall Cherokee baskets from the Eastern Cherokee tribal art gallery. 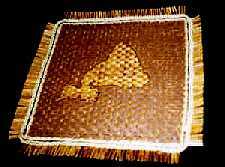 Traditional swamp grass baskets and mats by a Nuu-Chah-Nulth basket-weaver. Orders by commission. She weaves Northwest Coast basket hats and cloaks, too. Spruce root and seagrass baskets by Haida and Aleut weavers. Proceeds benefit an Alaska Native organization. Native cedar bark and spruce root baskets woven by a Tlingit artist. Woven fiber baskets from Mexican and Central American Indian tribes such as the Tarahumara, Pima, and Seri. Yucca baskets woven by the Tarahumara people of Mexico. Proceeds benefit a Baptist mission there. East Coast and Plains Indians were well-known for embroidering their regalia and jewelry with arduous porcupine quillwork, and they also wove the stiff quills into their baskets and birchbark boxes. Some native artists, particularly the Ojibway, still carry this tradition on today. Visit our quillwork gallery to view Indian quill baskets for sale. The Plains Indian tribes did not generally do much in the way of basketry arts. Instead, they made containers called parfleche out of rawhide (hard, untanned leather) and painted them with traditional pigments. 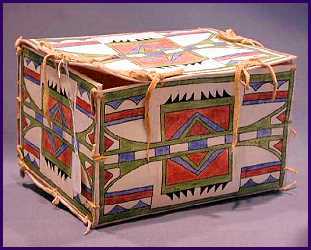 Some of these containers, particularly in the north, were shaped like birchbark baskets, but more often they were in the form of boxes, handbags, or cylindrical quivers. Some Plains artists still carry this tradition on today. Visit our Indian bags gallery to view parfleche and tanned leather pouches for sale. Photographs and in-depth exploration of native southwestern coil basketry. Color photos, art history, and interviews with California basket weavers. 1904 anthropology/art history text with lots of old basket photos. More recent art history book on Native American basket-making. Illustrated guide to native basket-weaving by the Navajo School of Indian Basketry. Photography and descriptions of Northwest Indian baskets and basket garments. Here's an interesting book on the Inuit basket weaving tradition, which started in the 1920's. 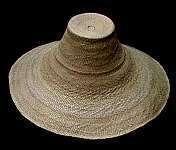 Native American Basketry: Description and photographs of native coiled, woodsplint, and sweetgrass baskets. Native Basketry: Survival, Beauty: In-depth articles and pictures of various American Indian basket styles. North American Indian Basketry: Article about native basket art by a California Indian weaver. 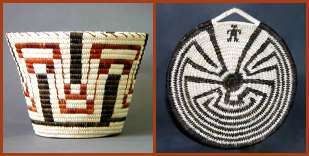 California Indian Basketweaver Association: Native basketry organization working on behalf of California Indian artists. Northwest Native American Basketweavers Association: Organization supporting Northwestern Indian artists in the US and Canada. California Indian Basket Museum: Online photo gallery of Mission Indian baskets and other indigenous Southwestern basketry. Hopi Baskets: Two photo-essays on Hopi Indian basketweaving. Walk In Beauty: Article on the history and traditions of weaving Navajo baskets. California Indian Basketry: History and photographs of Native American baskets from the various California tribes. About us: This website belongs to Native Languages of the Americas, a non-profit organization dedicated to preserving and promoting endangered Native American languages. We are not artists ourselves, so if you are interested in buying some of the baskets featured on this page, please contact the artists directly. Though we have featured only Native American baskets identified with the name and tribal affiliation of each artist, we haven't called the tribal offices to check up on any of them, and we only know a few of them personally. We also don't guarantee any of their products. 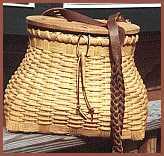 This is not an exhaustive list of American Indian baskets--if you would like us to add your native basket site to this page, please contact us with your URL and tribal affiliation. We advertise any individual native artist or native-owned art business here free of charge. We do not link to baskets which are not made by tribally recognized American Indian, Inuit, or First Nations artists, so please do not ask us to. And finally, websites do occasionally expire and change hands, so use your common sense and this general rule of thumb: if the creator of each individual artwork is not identified by name and specific tribe, you are probably not looking at a genuine American Indian basket.